Born and raised in Cincinnati, Ohio, Mikki Klug grew up with art in her heart. In high school she took special courses in art and attended the Central Academy of Commercial Art in Cincinnati. After graduating, Mikki moved to Cleveland and worked as a designer, illustrator and director in the personal expressions and toy industry. 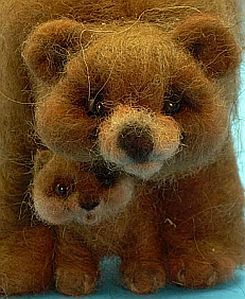 As a child, the first teddy bears in Mikki and her twin sister's life were soft brown bears with well-worn ears that looked like handles “because that's how we carried them around as children. Our bears went everywhere with us,” she recalled fondly. What she didn’t know then was what an impact the love of animals would have in her future. 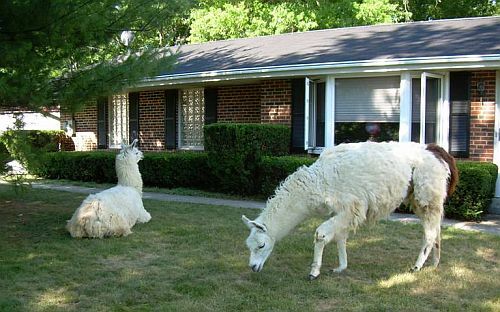 "We have three llamas now. Bob, the biggest white one is very smart. He can turn on the fans and the water faucets in the barn. Sunny, Bob's best friend is another white, who marches to his own drum and has the softest wool. 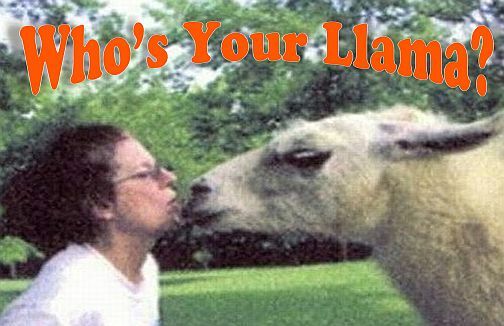 Moe, a brown and white llama is very smart too. Nothing gets by them as they are very alert. 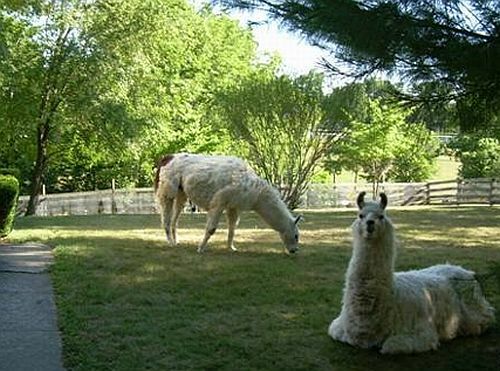 The llamas have free range throughout the five acres of fenced property," said Mikki. Her business name evolved from taking care of orphaned animals; Cripple Creek Creative seemed to fit as the two llamas had leg injuries plus one cat and a dog had been hit by a car. “Our farm has two creeks running through the meadows,” Mikki added. In her spare time, Mikki enjoys relaxing to music, watching movies at home, drawing and reading with a preference toward historical novels. 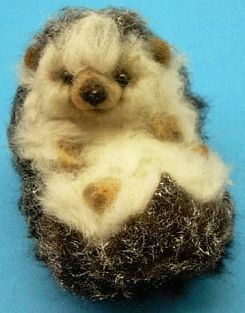 Getting started with needle felting came when Mikki saw an article in a teddy bear magazine describing needle-felting. “I thought it was something I could do and I had a ready supply of wool with my llamas,” Mikki remarked, smiling. Mikki ordered her first felting supplies from Neysa Phillippi who answered her questions and critiqued her work. 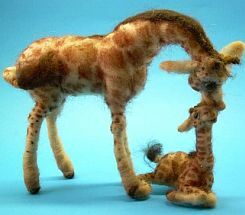 She started felting in January 2004. Each year Mikki creates and makes about 200 designs. 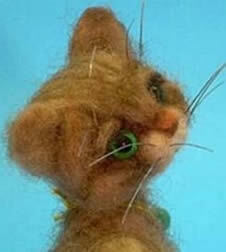 Because of the delicate nature of her needle felting, none of her designs can be commercially made. She has never sold her design or patterns because all her work is done without formal patterns. 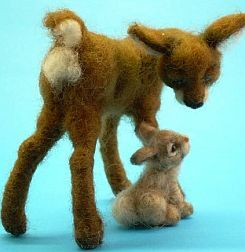 Her illustrating, painting and sculpting experience have greatly benefitted her needle felting. "My work has a lot of hand shaded pastels and watercolor details," she explained. 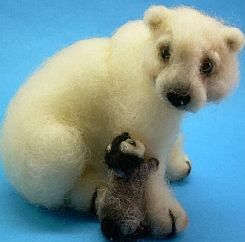 Mikki's creations are well recognized through their personality, (depicted by facial expressions and body posture), unique body positions and interaction between the feltie pieces (an example would be her polar bear with a penguin chick) which often tell a visual story. “My felties have been adopted by collectors of all ages, in many countries, such as England, France, Belgium, Netherlands, Italy, Australia, and the USA.” Mikki receives custom orders from collectors wanting their favorite pets depicted in felt. 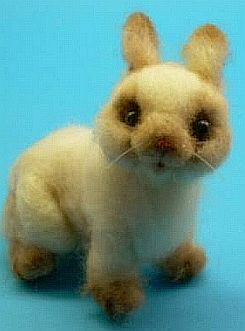 She makes various breeds of dogs, llamas, ferrets, hamsters, all types of cats, horses, goats, bunnies and sugar gliders; all seem to find their way into her creative process. 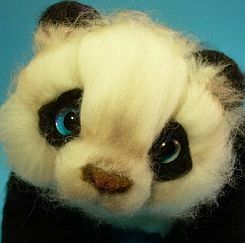 Mikki's work has been featured in Teddy Bear Review, Teddy Bear & Friends, Teddy Bear Scene. She won two TOBY Awards this year; one award was for a scene collaborated with Maria Collins plus two Third Place Awards. In 2006 she won a Fifth place award in the URSA Awards Contest. “I like all venues. I feel that all are ways of communicating with people, getting to know them and sharing something.” And when we look into the faces of Mikki’s creations, we know that they are communicating with all those lucky enough to have them in their collections. Llamas in the yard at Cripple Creek - What a nice life. 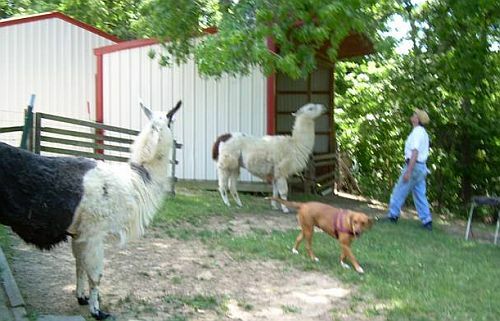 Ron chatting with the llamas near the barn.